For almost a decade I’ve been talking a big game about how when my friends and family have kids I fully intend to be “crazy Aunt Celia.” A defining characteristic of Aunt Celia is that she brings a new picture book with her whenever she visits. Well, the dream is now reality (and I’ll stop talking about myself in the 3rd person!). My friends have coached their little ones (parent: “What does Aunt Celia like to do?” child: “READ!! !”), picture books have become my #1 book buying category, and I couldn’t be more pleased (they’re so fun!). 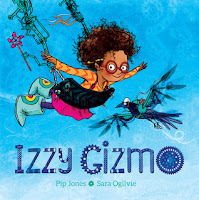 I’ve been really impressed by the recent crop of picture books, including Pip Jones’ Izzy Gizmo, beautifully illustrated by Sara Ogilvie. Izzy Gizmo just loves to invent, but her inventions never seem to work the way she wants them to. When she finds a crow with a broken wing she just has to help. Izzy tries again and again to build him a new pair of wings, but nothing is working. Can Izzy overcome her failures? Or will her new crow friend never fly again? This wonderfully feisty new character from bestselling author Pip Jones is brought to life by acclaimed illustrator Sara Ogilvie. Precocious young inventor Izzy lives with her supportive grandfather. She designs and builds machines of all kinds, though they don’t always seem to work as they ought. When Izzy finds an injured crow one day, she takes it home – and so begins her most ambitious project yet – to fix its wing. However, some problems can’t be solved easily. Izzy will need to learn to try and try again before she succeeds. Izzy Gizmo’s smart, quirky protagonist and her will to carry on despite setbacks will please plenty of children and their parents. The story is rhymed, which could annoy/delight depending on the reader. For my part, it lent the book charming, rhythmic pacing. I look forward to seeing what my nieces think about it – though I expect they’ll be focusing mainly on the vibrant illustrations (and possibly the crow sidekick). Of course the pictures matter as much (or more!) than the story in some cases, and the art of Izzy Gizmo is eclectic, funny, and possibly inspiring for junior inventors in the wild. Beyond the bright colors themselves, I loved the small details in Ogilvie’s art, like a flying pig lamp, the grandfather’s recognizable Ikea armchair, a picture of an animal with a whole pot stuffed in its mouth at the vet’s office. These subtleties will make rereads a pleasure for both children and adults. The single thing I loved most about the book? Izzy is a black girl with natural hair and glasses. Though the book has a light tone, Izzy learns serious lessons about coming up with original ideas, getting frustrated, researching to come up with a better solution… and in the end, going back to fix any messes you’ve made along the way. It’s positive picture book representation for smart little girls, and that’s important. On a personal note, I may have been predisposed to like Izzy because I read this book the day I found out that I have a new niece with that name. This will (of course) be one of her gifts in the coming years. In all, Izzy Gizmo is a smart, fun picture book with verve. It’ll pair excellently with Rosie Revere, Engineer and other Andrea Beaty books. Recommended for: readers aged 4-8 and their adults, and especially young ones interested in how things work and/or inventing. Fine print: I received an advance copy of this book from the publisher for review consideration. I did not receive any compensation for this post. We love Iggy Peck, Architect and Rosie Revere, Engineer. We'll have to check out Izzy Gizmo! Awww, congratulations on achieving all your aunting dreams! I like to imagine that I am a fun aunt to my little nephew, but honestly I have been falling down on the job w/r/t getting him books. We love to read together, but a lot of his books up until now have been SO BORING. He's getting old enough now to read actual books, though! I'm optimistic!